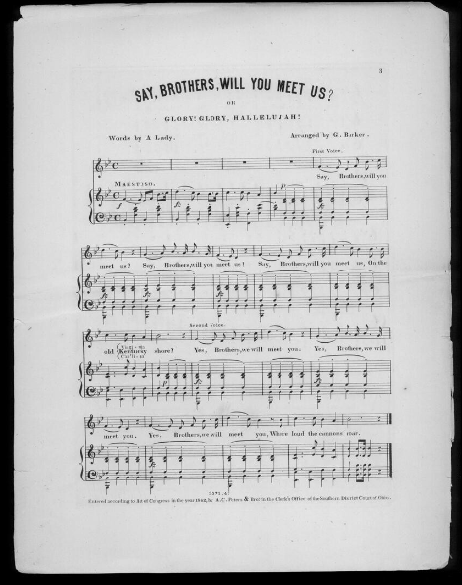 This entry was posted in Madeleine Stephens and tagged battle hymn of the republic, helen kendrick johnson, john brown's body, Library of Congress, say brothers, spirituals by stephens. Bookmark the permalink. M, the story you sketch here gets at so many of the issues and repertories we’re talking about this semester: camp-meeting tunes, oral transmission of folk music, separate-but-somewhat-similar musical traditions among black and white church congregations, music’s use as a political or propaganda tool… the list goes on and on! 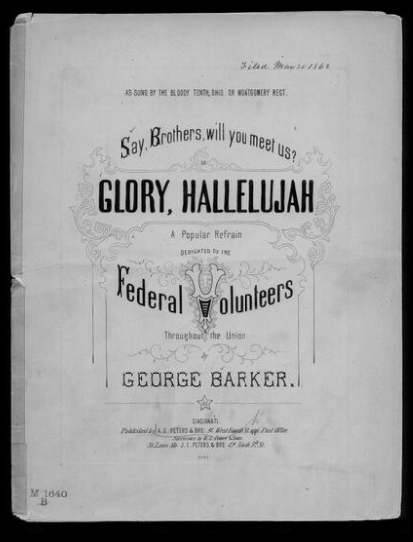 I’m not sure it’s quite fair to cast this as an example of whites appropriating black music, since the tune is documented back to the 1700s among Revival camp meetings. 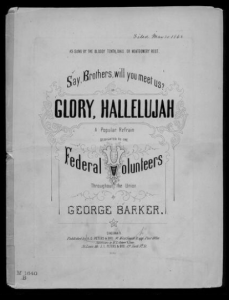 It’s perhaps better characterized as one of the few tunes black and white congregations both preserved, which is interesting in itself. 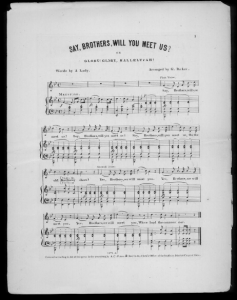 And Helen Kendrick Johnson’s article is fascinating for wanting to give credit to the black church in Charleston where she believes the song originated (even though we know today that it is much older). So you’re on the right track here, even if the conclusions you draw seem like a bit of a stretch. 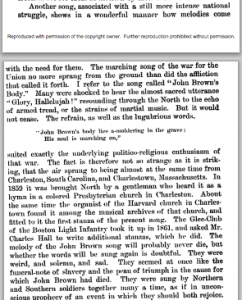 For your next post, try to do more of your own analysis of a primary source document, rather than briefly introducing it but otherwise providing mostly background information that you glean from internet sources. (If you do want to give some background, check out a book or reputable music encyclopedia first, rather than googling.) Keep up the good work!